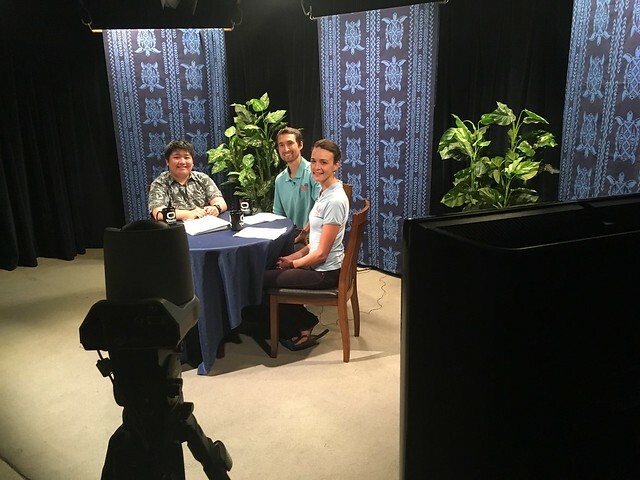 HWMO’s community outreach team members, Lele Kimball and Pablo Akira Beimler, had the exciting opportunity to be interviewed on the set of Olelo TV in June. Lele and Pablo shared about their experiences working for HWMO, the impacts of wildfire, and how people could take action right from their own homes. They also highlighted the Firewise Communities efforts of Kamilonui-Mariner’s Cove, who have been doing an amazing job rallying their community to prevent wildfires. The interview will be aired on television at a later date as part of the Maunalua: Past, Present, Future series. Stay tuned! Special thanks to Elizabeth Reilly of Livable Hawaii Kai Hui for arranging this fun opportunity for us to share!